Titanium. What’s All The Fuss About? Titanium oxide is known as a Transition metal and is the 9th most abundant element in Earths’ crust, occurring mainly in igneous rocks. It has the chemical symbol Ti and is number 22 in the table of elements, having the atomic number 22 (the number of protons in the atomic nucleus). Discovered in England toward the end of the 18th century by a pastor, it was originally given the name Manaccanite after his local parish. Later it was renamed Titanium by a German chemist after the Greek Titans. As a metal it is extremely useful in the manufacturing of higher quality metal products. Titanium metal has a low density but a very high strength. It is described as somewhat inert, in that it doesn’t really interact or do anything that leads to breaking down in any way, and this is exactly why it is so useful as a structure metal. It resists acids and alkaline and does not corrode, a welcome relief from the annoying experience of rust or white powder aluminium oxide found in many steel and aluminium products. As a bicycle frame it is employed as an alloy. In the case of Van Nicholas frames, the alloy is 94% Titanium, 2.5% Vanadium and 3% Aluminium. This is why the description 3Al/2.5V Titanium appears on Van Nicholas frames. Its advantages to aluminium and steel can be seen in the illustration below. 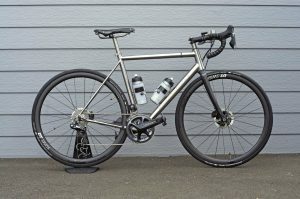 As a finished product, Van Nicholas titanium frame bikes are like nothing else. They represent the pinnacle of bicycle design, both in terms of ride experience, toughness and longevity of frame material, and the aesthetically beautiful soft brushed finish simply adds to their desirability. Below is what Van Nicholas say about Titanium and their bicycle frames. The 3Al/2.5V Titanium alloy we use was developed for use in high pressure hydraulic lines and is found on virtually all new military and commercial airplanes. We are not alone in recognising Titanium’s unparalleled qualities. Marine, architectural, medical and petrochemical industries all regularly make use of Titanium components, and you can also find its magical properties gracing consumer goods like golf clubs and jewellery. Titanium’s extreme oxygen reactivity (the same process that makes it so impervious to corrosion) makes production of the seamless tubes a very long and expensive process – hence the premium price tag’.